Road cycling coaching, including competitive and ultra. Coach thru Peaks Coaching Group. 10+ years experience coaching, 20+ racing, MS-ExSci, NSCA-CSCS. Exp. with masters, foreign athletes, diabetic. Check out www.PeaksCoachingGroup.Com for more information about coaching packages. Work with foreign athletes, communicate via Skype-email-Facebook (English language only). Also work with diabetic (Type 1 and 2) athletes. USA Cycling Elite (Level 1) Coach, MS ExSci,and Certified Strength and Conditioning Specialist (National Strength and Conditioning Association). Affiliated with Peaks Coaching Group. Twenty years as a competitive cyclist and many years as a recreational cyclist. 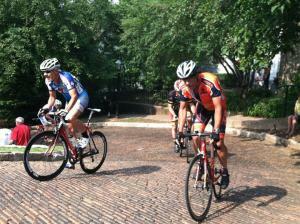 Involved in managing a large Midwest racing team and also promote several cycling events each year. Experience in ultra racing as coach-competitor-crew, inlcuding RAAM/RAW, Furnace Creek 508. Primarily work with athletes who train with power meters. Success. Coach Randy Catron has been notified of your message.